Competition ice skating dresses in fabulous styles and colors! Get custom designed ice skating dresses that are ready to wear. Designer on-the-go for people in a hurry. This page contains individual ice skating dresses - each dress is available in the size and color shown. If you would like to order an Ice Collection dress in a different size or color, please contact us for availability. If you don’t have time for the designing process – look no further! Love what you see? See it and, yes, it is ready to go. These ice skating dresses are in stock and available for immediate purchase. Get the designed-just-for-you look without the wait! This will change the way you think about designer ice skating dresses, figure skating dresses, and skatewear! Keep checking back to see newly added items! Ice Collection ice skating dresses usually ship from Revella Skatewear on the next business day following your purchase. This excludes weekends, holidays, closures, and unforeseen events. These are individual ice skating dresses, and are not part of our regular merchandise. Each Ice Collection ice skate dress includes a matching hair tie. Sales of these items are available on a first come, first serve basis. Don’t hesitate! Or the one you want may be gone! See bottom of page for more information. Style ICE706 - Girls ice skating dress size 13 in hibiscus with appliques. NEW! Beautiful, long sleeve ice skating dress in hibiscus with appliques. NEW! Gorgeous ice skating dress in purple. Halter-style ice skating dress has purple mesh rouching on the front and back of the bodice. NEW! 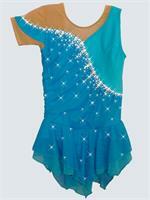 Darling, royal blue ice skate dress will delight your skater! Fabulous ice skating dress in lovely purple-pink colors of blackberry and berry. Gorgeous ice skating dress in shades of turquoise! Gorgeous ice skating dress in violet with light blue accents. Fabulous ice skating dress in raspberry and peach spandex. Dramatically beautiful ice skating dress with enough crystals to light up the ice. One only, size Adult Extra Small. Click on the "more info" button to see larger images. Lovely ice skating dress in shades of blue. One only, size Child 14. Click on the "more info" button to see larger images. Gorgeous orchid color ice skating dress! One only, size Adult Medium. Click on the "more info" button to see larger images. Be sure that you know your Revella Skatewear size. Visit our on-line Sizing Guide or contact us for assistance. Ice Collections ice skating dresses cannot be returned for refund or exchange. We are happy to send free fabric samples for any of the Ice Collection ice skating dresses when available. Please feel free to contact us for additional details about any item. Please read our on-line Policies prior to ordering. Ice Collection ice skating dresses are often manufactured with fabrics, colors, crystals or decorations that are limited in quantity. You may not be able to order an Ice Collection skate dress in a different size due to lack of materials. In that case, we will use available materials to create a similar dress. Contact us for specific information about availability. On occasion we may decide to re-produce any Ice Collection skate dress in another size or color, or same size and same color. We do not guarantee the uniqueness of any item. If what you are looking for is not available in our Ice Collection, please visit our Design Center to begin the designing process. Enjoy looking over the ice skating dresses, figure skating dresses, and skatewear available on Ice Collection! Choose your style. Choose your color. Genuine Revella Skatewear. We offer a wide selection of colors for girls ice skating dresses, figure skating dresses, and ice skating competition dresses. Girls skating dresses in beautiful styles and colors. Let our friendly customer service help you get the ice skating dresses you want. Customizing options are available through our Alterific page for all of our ice skating dresses. It's easy to get the figure skating dress you want! Choose from our selection of sleeve styles and skirt styles on our Alterific page to customize your ice skating dresses. 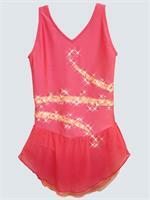 We offer beautiful women's figure skating dresses, and pretty ice skating dresses for girls. Any dress. Any available color. The choice is yours. Revella Skatewear. 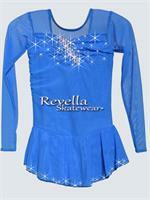 Choose Revella Skatewear for your next competition ice skating dresses.